Skeletal animation is a technique for simplifying the animation of complex geometries, such as humanoid characters in a game. An animation skeleton is a simple hierarchy of control nodes, which themselves have no visible geometry. 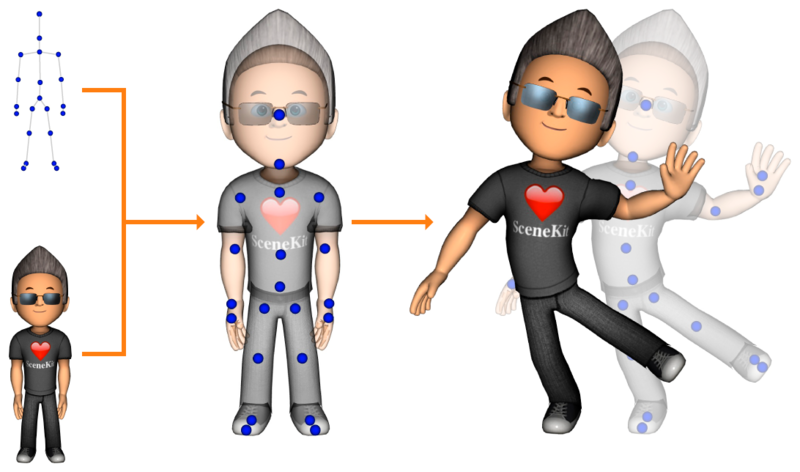 Associating the skeleton with a geometry (also called “skinning” the skeleton or creating a skinned model) allows SceneKit to automatically deform the geometry when you move the skeleton’s control nodes, as shown below. Typically, an artist creates a skinned model using external 3D authoring tools and saves it, along with animations that use the skeleton, in a scene file. You load the model from the scene file and pose or animate it in your app, either by using animation objects also loaded from the scene file or by directly manipulating the nodes in the skeleton. You can also create a skinned model from separately defined geometry and skeleton data using the init(baseGeometry:bones:boneInverseBindTransforms:boneWeights:boneIndices:) method. Creates a skinner object with the specified visible geometry and skeleton information. The geometry whose surface the skinner’s animation skeleton deforms. The coordinate transformation for the skinner’s geometry in its default state. The root node of the skinner object’s animation skeleton. The control nodes of the animation skeleton. The default transforms for the animation skeleton’s bone nodes. The geometry source that defines the influence of each bone on the positions the geometry’s vertices. The geometry source defining the mapping from bone indices in skeleton data to the skinner’s bones array.